Making the bed may feel like a tedious task, but a properly made bed is important to a good night's sleep and can be a small source of satisfaction when completed each day. If you sleep in a cold room, your usual bed coverings may include a few extra pieces, such as a down comforter and a quilt for optimal warmth. As during warmer weather, the sheets go on the bed first, offering a sense of comfort as you slide between them to get cozy each night. 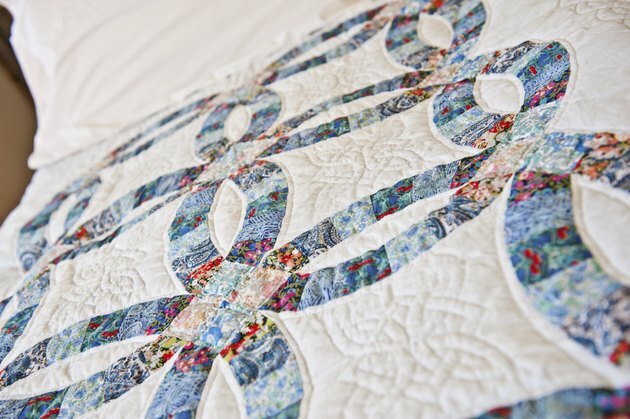 A quilt is spread across the top of a bed. Start with sheets. Most sheet sets come with a fitted sheet for the bottom and a flat sheet for the top. Just spread the fitted sheet over your mattress (and mattress pad) and pull the corners snugly around it. Lay the flat sheet even with the top of the mattress and right-side-down over the fitted sheet and tuck in the bottom and sides. Placing the top sheet right-side-down ensures that the right side of the sheet is showing when you turn the bed down. Lay a blanket on top of the flat sheet and tuck in the corners and sides. Place the blanket so the top is about 6 inches below the top of the flat sheet and mattress. This makes it easier and tidier when you turn the bed down. Down comforters are a warm and cozy addition to your bed. Put your comforter on top of the blanket to keep it from getting squished down under too many layers of other bedding. It also keeps the comforter free from sweat, which may accumulate in the down and make the comforter feel clumpy. Leave the comforter untucked. Lay your quilt lightly over the entire bed as the last step in making your bed. Quilts are a traditional bed covering that goes on top to display the pattern, but choose a lightweight quilt to place over your down comforter in order for the comforter to stay fluffy. If you feel too hot under all the covers, the quilt is easily folded downward toward your feet. Anna Roberts has written professionally since 2007, specializing in home and garden topics for the web, among other subjects. She recently expanded her gardening and sustainable food expertise by spending a year "locavoring." Roberts holds a Bachelor of Science in visualization from the Minneapolis College of Art & Design.